mon petit lyons: Happy Halloween! 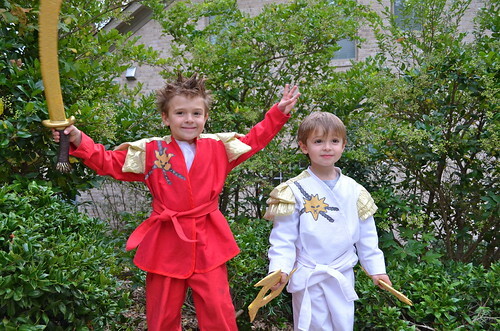 Okay, I know I am a day early but since I finally finished the Lego Ninjago costumes I had to share. In case you are not familiar with Ninjago (which is a foreign idea to me, as it consumes nearly every minute of our household play and conversation between the hours of 8am-8pm), it is a series of Lego sets with a cartoon tie-in about 4 ninjas who practice the ancient art of Spinjitzu (it is actually much more involved than that, but I will spare you). 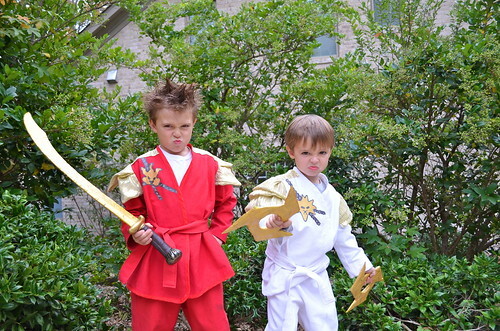 Jack chose to by the red ninja, Kai and Will picked the white ninja, Zane. The pants were easy peasy, 15 minute pajama pants that I make all the time. The jackets were really not much harder. As soon as I realized that the Out on the Town Jacket in the Sewing for Boys book was collar-less I knew I could draw about two lines and have the perfect pattern. I added a bit of length and extended the front pieces out kimono-style. I made a tie that I attached on the back. Of course the "golden armor" portion was a bit trickier. I started with Will's and just added a few layers of folded gold lame fabric into the shoulder seam. With Jack's I decided to first sew three big zig zags with fabric right sides together & a layer of batting, turn them right side out and then attach them into the shoulder seam. They both work. Then it was just some fabric paint for the crazy patch/emblem things and painted on ties behind them. I thought about sewing cording for those, but I had paint on hand and it ended up being fine with them which is really all it comes down to! On top of the costumes, I also had to make weapons as each of the four Ninjas represents an element and has a corresponding golden weapon of Spinjitzu. For Kai, the Fire Ninja, this meant a Sword of Fire. Easy enough, I spray painted a sword gold. Zane, the Ice Ninja, was a little trickier. The Shurikens of Ice are basically throwing stars and my first attempt was a massive sewing fail. So I moved on to cardboard and paper mache. 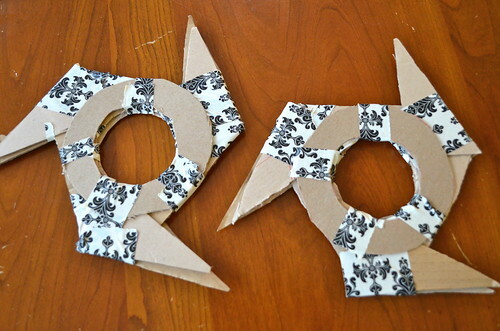 These are the shurikens pre-paper mache and golden paint. Do you like my damask duct tape? Sadly, lost on the ninjas. I am usually not in favor of homemade halloween costumes as I would rather make something that gets more use, but considering these have been worn every day since I've made them, they might be our most frequently worn clothing of any kind. Also, they were just dead set on being Ninjagos and no one sold the costumes. With all of the other marketing it sure seems like an opportunity loss for Lego, but I guess they are already making a killing! This picture is from our Halloween block party on Saturday night. The kids had a blast even though their costumes were not entirely completed. Oh, and a big thank you to Target, for selling these darling little sugar decorations. I made cupcakes and the most effort I had to extend was piping on the homemade frosting, but looked liked a pro by sticking these guys on top. 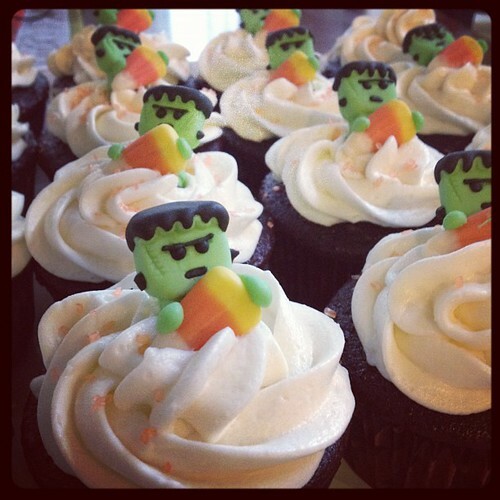 Have a wonderful Halloween! I hope you get lots of candy & no pennies! So very clever and adorable. Oh your little Ninjago folk look fantastic! Well done you! My daughter has worn & worn the various halloween costumes I've sewn for her. 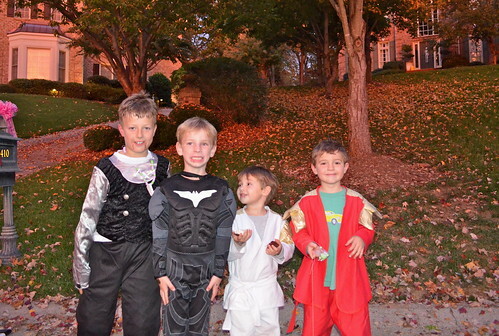 Most of them have been outgrown and passed along to younger cousins who also love to dress up & play in them. They don't seem like something that is going to be worn a lot, but just wait until you have to ask them to change every time you want to go somewhere, lol. No princesses for my daughter, either, I've made a fish, a space alien, & dragon costume for her. Oh, yeah, and bionicle. I think your ninjago came out great! wow! 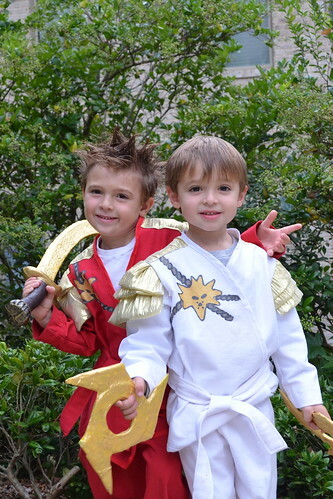 these costumes are fantastic and i'm sure your boys loved them! too funny....I thought I was the only one who knew about pennies! love the outfits!